Cuenca is located high in the Andes, at 8,200 feet above sea level (2,500 meters). Thanks to its elevation, it offers spring-like weather year-round. 1. Algarve, Portugal. Portugal's Algarve is the best place in the world to retire in 2014. This Atlantic coastal region is already home to more than 100,000 resident expat retirees and offers the best of the old world, from medieval towns and fishing villages to open-air markets and local wine, plus some of Europe's best beaches. The Algarve also boasts great weather, enjoying 3,300 hours of sunshine per year, more than most anywhere else in Europe. Portugal ranks as the 17th safest country in the world. The infrastructure is good and improving, and the health care is international-standard. Medical tourism is a growing industry. The cost of living in Portugal is among the lowest in Western Europe. A retired couple could live here comfortably on a budget of as little as $1,500 per month. And the country's new Non-Habitual Resident and Golden Visa programs mean it is easier than it's ever been for a foreign retiree to arrange legal residency. 2. Cuenca, Ecuador. 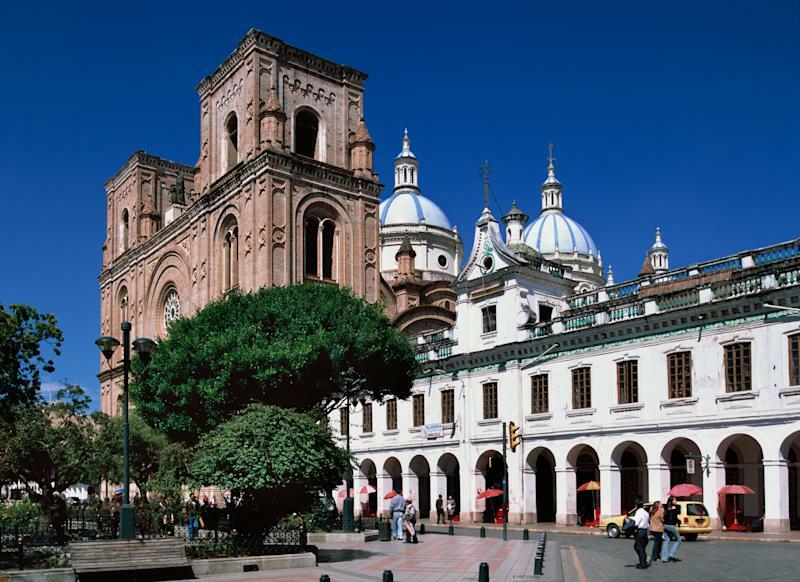 Cuenca is a charming, walkable colonial city in the highlands of Ecuador, meaning the climate year-round is spring-like. The cost of living is low (though rising) and the cost of real estate is near rock bottom for Latin America. The health care is high quality, honest and inexpensive. Cuenca's large and growing expat community is one of Latin America's most established and well integrated with the local community. Ecuador offers user-friendly retiree residency options, and the country uses the U.S. dollar, meaning no exchange-rate risk for American retirees. Thanks to the big and growing expat community based here, downtown Cuenca boasts cafes, restaurants, bars and bookshops alongside the traditional butchers, tailors, repair shops and bakeries. Cuenca is also the country's center of art and literature. You can attend the orchestra or a play and enjoy a tango show or an art opening, all often free. 3. George Town, Malaysia. George Town is a busy, thriving city with a large expat community that has managed to retain its colonial charm (it's a UNESCO World Heritage Site). The city is affordable, with a tropical climate, an intriguing culture and gorgeous white-sand beaches. George Town's total population is about 740,000, small enough that it's easy to make friends and meet people, yet big enough to mean health care that meets international standards and easy availability of the goods and services most retirees are looking for. Year-round sunshine, first world infrastructure, turn-key permanent residency and English-speaking locals make the living here easy. This is a paradise for food lovers and, all things considered, one of the most livable cities in Southeast Asia. 4. Chiang Mai, Thailand. Chiang Mai has been luring expats from the west for many years with its low cost of living and great weather. The high quality health care and health-related services are also big pluses for foreign retirees. Chiang Mai boasts modern infrastructure and an abundance of Western amenities. It's also a place where it can be possible for foreign retirees to find work if they're interested in supplementing their retirement nest eggs or simply looking to become involved in their new community. Many Westerners are employed in Chiang Mai in language schools, universities, medical facilities and tourist-related industries. 5. Dumaguete, Philippines. In addition to its welcoming, friendly, English-speaking people, Dumaguete boasts a warm, tropical climate and lots of opportunity for outdoor adventures, including world-class diving and snorkeling and whale and dolphin watching. Dumaguete sits right along the ocean, with attractive beaches to the north and south of town. This is also a university city, meaning an abundance of inexpensive restaurants that cater to "starving" college students. Foreigners have the opportunity to make friends with educated professors and aspiring students, take classes and enjoy cultural opportunities not typically found elsewhere in the Philippines, including theater, ballet, art shows and libraries. Medical and dental care is good, with a new hospital under construction and international-standard health care available in nearby Cebu. More than 5,000 retirees, including many Americans, have decided to make Dumaguete their permanent home. The primary appeal for would-be retirees is a super-low cost of living. A couple could retire here on as little as $1,000 per month. 6. Pau, France. The city of Pau, also known as the "Green City" and the "Garden City," has one of the highest ratios of greenery per square meter per person of any European city. Further, Pau's greenery is tremendously diverse and includes trees and plants from Japan, the Caribbean, Mexico, Lebanon, the Mediterranean, Chile and California. This huge variety is in part thanks to the English settlers who came here after the Napoleonic wars and brought with them their love of gardening and parks. Pau's is a landscape of accessible woodlands, the steep slopes of Jurançon wine country, the history-packed Plaine de Nay and its main town of Nay and the pretty rolling countryside and ancient towns of the Gaves de Béarn. Pau is a university town, with close to 12,000 university students living on and off campus, helping to keep it lively. A retiree who has dreamt of France but who can't afford Paris should consider Pau. A couple could retire here on as little as $2,000 per month. 7. Medellin, Colombia. Medellin is a city of parks and flowers. It's pretty, tidy and, despite its checkered past, safe. It's also architecturally consistent and pleasing. Almost every building is constructed of red brick and topped with red clay roof tiles. The overall effect is delightful. Medellin is both an industrial, economic and financial center for this country and a literary and artistic one. Newspapers, radio networks, publishing houses, an annual poetry festival, an international jazz festival, an international tango festival, an annual book fair and, back in 1971, Colombia's answer to Woodstock, the Festival de Ancon, all have chosen Medellin as their base. Thanks to its mountain setting, Medellin is another of a handful of cities around the world that bill themselves as lands of eternal springtime. The cost of living is affordable, though not super-cheap. The medical care is excellent, with five of the 35 best hospitals in Latin America located here. Medellin was named 2013's World's Most Innovative City. It is finally beginning to shed its bad-boy image from the Pablo Escobar days and to become appreciated for the romantic city it is, with good wines, great coffee, outdoor cafes and open-air music venues. 8. Abruzzo, Italy. It's hard to think of a lovelier corner of Italy than the Abruzzo. The beaches are golden, and the sea rolls out like a giant bolt of turquoise silk. There are mountains, too, which means that, living here, you would have both skiing and beach-combing on your doorstep, depending on the season. This region is one of Italy's secret treasures. There's no over-crowding or heavy industry, only castles, vineyards and villages made of stone. Life in the Abruzzo hasn't changed much over the years, and exploring here is like wandering into a gentler, kinder yesterday. This region of Italy is also one of Europe's best bargains. A couple could retire here on as little as $2,000 per month or less, including rent. 9. Panama City Beaches, Panama. The most developed, established and fully appointed beach community in Panama is what's referred to as the "City Beaches" area, those Pacific coast beaches that lie one to two hours west from Panama City. This fast-growing region offers a high quality beach lifestyle with all the amenities and services you could want. Coronado town has developed into a busy commercial center that makes for a turn-key retirement choice. This former weekend retreat is evolving into a full-fledged retirement community with an established population of full-time foreign residents supported by a developed infrastructure, including good medical facilities. Plus, Panama uses the U.S. dollar, international-standard health care is nearby in Panama City and Panama's pensionado retiree residency program is one of the world's best. 10. Istanbul, Turkey. Mega-city Istanbul straddles the shores of both Europe and Asia. It is the only city to have been a capital to both Christian and Muslim empires, as evidenced, inside its great Roman walls, by an architectural legacy like nothing else anywhere on earth. Though not the country's capital, Istanbul is Turkey's beating heart, offering the best of any European capital city, from lattes to the latest Hollywood releases in English, but with an edge and an energy that can be lacking in Continental Europe. Istanbul is a place to watch the world go by beneath a skyline of minarets and modern office blocks while ships from across the globe pass up and down the Bosphorus. The best part is that this world-class city is also exceedingly affordable, perhaps the best place in the world to enjoy city living on a budget. A couple could retire here on a budget of as little as $1,100 per month.